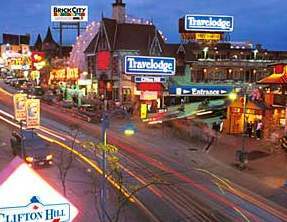 The Travelodge at the Falls on Clifton Hill offers the best accommodations, attractions and dining on Clifton Hill. Located in the center of the Tourist District, the Travelodge Hotel offers all the attractions of Clifton Hill right outside your room, and guests are only a short walk away from the Falls and the attractions on the Niagara Parks. With a wide variety of options for dining, accommodations and attractions, the Travelodge at the Falls is the perfect hotel for your next Niagara Falls vacation. The Travelodge at the Falls on Clifton Hill Hotel is the perfect hotel accommodation for any type of traveler. Whether it be a romantic getaway or a family vacation, the Travelodge is your ideal Niagara Falls Hotel. All the fun is located at the entrance of the hotel, with Clifton Hill attractions, the Niagara Falls, Falls Avenue attractions and the Niagara Parks attractions within walking distance. With plenty of Niagara Falls vacation packages available at this hotel and complimentary breakfast at Ruby Tuesdays, the Travelodge at the Falls is the perfect place to stay in Niagara Falls.